Get into the fondue Art, from different angles, thanks to this publication, already available in many languages. 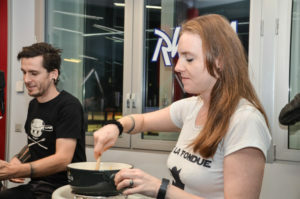 Real french swiss citizens and thus fondue enthusiasts, the couple composed of Jennifer and Arnaud Favre, are also founders of the first Fondues Festival, called the Compagnons du Caquelon (the name of the Fondue pot). 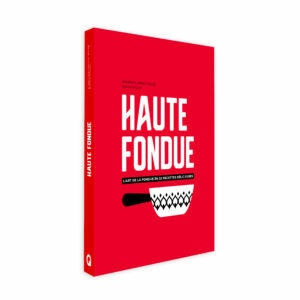 In the same way, they published, last September 2018, Haute Fondue, this original and gourmet book, focused on this traditional swiss dish, with the best recipes to discover also new home designed creations, with revolutionary culinary associations. 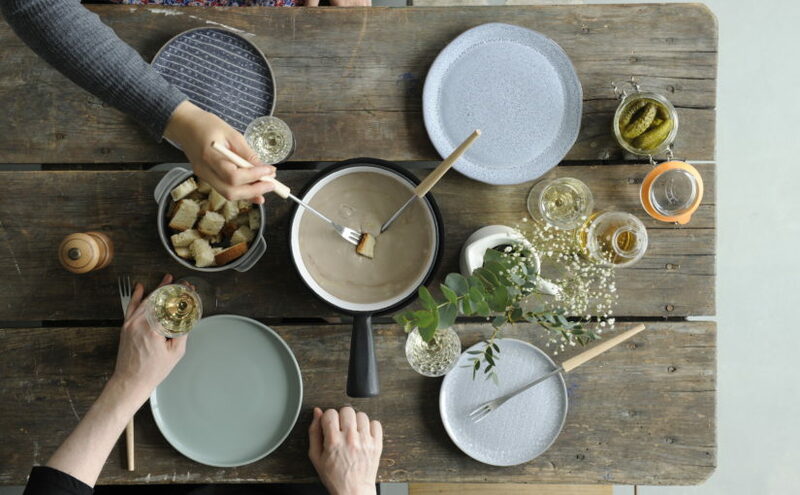 What we can remind from this ancestral and national Fondue, is naturally conviviality! This is certainly what helped to make it the Swiss national dish, since decades as we found the first manuscripts of the concept from a document, found in Zürich in 1699. 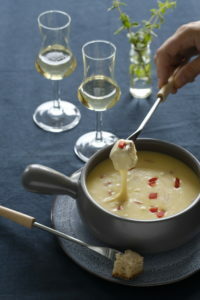 There are thus different original variants depending on the region (even in France, in Savoie and Jura) and therefore the cheese used, even if the classic is usually composed of Gruyère and Vacherin, melted in white wine (photo credits: Dorian Rollin). 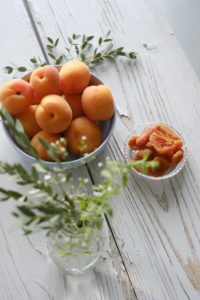 Who loves the culinary tradi tion can also dare new variants and experiences. For your guidance, Jennifer and Arnaud Favre live in Riddes in Valais. One day, around a caquelon, they got fun into mixing tastes and flavors in a creative experimentation around this Swiss national dish. The idea first took the form of a festival that immediately found a certain success. This encouraged them to share and summarize their nearly scientist creations, around their gastronomic passion in a book. We may count many culinary specialties, from all around the world, having experienced a wave of creativity. This was indeed the time for the generous and delicious fondue. To get into this, the authors Jennifer and Arnaud teamed up with professional photographer Dorian Rollin. They selected 52 recipes so that the most motivated cooks would have the chance to make it one different receipt every week. This gives a book richly illustrated and also an inspiring one to try new innovations. 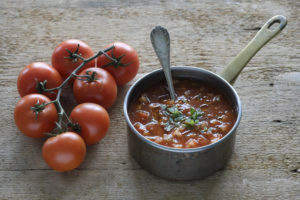 Whether it’s a blend of goat cheese, a half-half spiced with old-fashioned mustard, a tomato version (see nearby photo) or even a peppers-grappa creation: a new culinary experience would figure at the end of this selection. 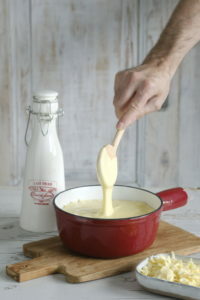 This is the primary purpose of the book Haute Fondue and its authors. This year, many European booksellers and medias will welcome the couple of authors for dedication sessions and meetings. This marathon already started with the launching of the book, at the Swiss Book Festival in Sion last September 2018. 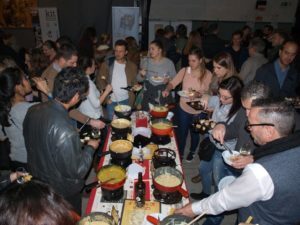 Then, the pages travelled among the Valais Fair and twenty other dates in French-speaking Switzerland, like of course the homemade biennal Fondue Festival of La Grande Caquelonnade, that occured last November 2018 at La Belle Usine, Fully, in Switzerland (photo credits: Fabien Mérinat). Next edition on November 2020, don’t miss it! This book was also published in German and presented at the Frankfurt Book Fair last October, after appearing in France and Belgium. And elsewhere in the world? 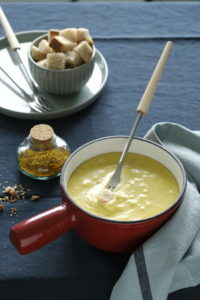 While waiting for other countries, Jennifer and Arnaud offer places to eat fondue in case of emergency (p.168). 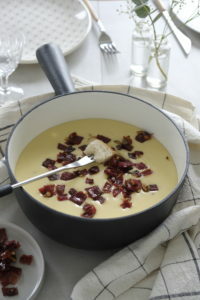 So, ready for the first fondue of the season? (photo credits: Dorian Rollin). Jennifer and Arnaud Favre, Photos by Dorian Rollin – ISBN 9782940481538 | 176 pages | – HELVETIQ edition.